BELIZE CITY, Mon. Nov. 27, 2017–The Premier League of Belize (PLB) 2017-2018 Opening Season is now down to two teams, Belmopan Bandits SC and Verdes FC, after completing the second leg of the semifinals series this past weekend. With 6-goal margins from their first games of the semifinals, both the Bandits and Verdes coasted through their semifinals home game, to set the stage for what has become perhaps the most anticipated finals showdown in years. 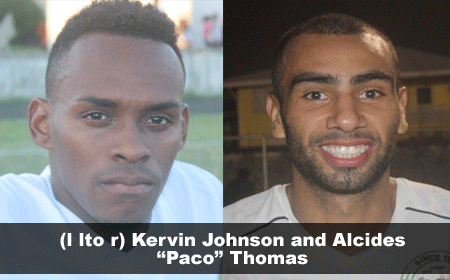 On Saturday night at their Isidoro Beaton Stadium, home standing Belmopan Bandits SC jumped to a 2-nil first half lead, and cruised to a 3-1 victory over a game San Pedro Pirates FC. 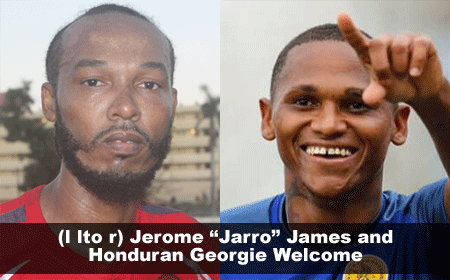 Top Honduran striker Georgie Welcome struck twice (3’ & 34’) for the Bandits in first half, and Jerome “Jarro” James added another (51’), while talented midfielder Jesse Smith (47’) scored for the visitors. Despite the aggregate 9-1 result from the two semifinal games, the Bandits suffered some setbacks, as both captain Elroy Smith and midfielder Khalil Velasquez were red-carded by referee Fareed Ahmad, and should be unavailable for the Finals game 1. San Pedro’s Hector Martinez was also ejected, but he will serve his suspension at the start of the Closing Season. 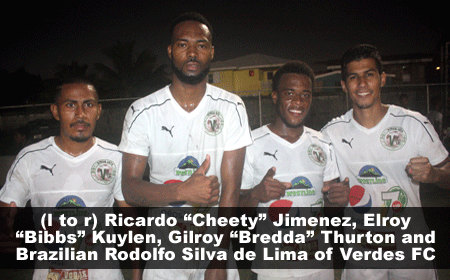 In the other semifinal, on Sunday at the Norman Broaster Stadium, Verdes FC also grabbed an early 2-nil lead, with goals from Brazilian Alcides “Paco” Thomas (17’) and Gilroy “Bredda” Thurton (36’), despite keeping star midfielders Denmark Casey, Elroy “Bibbs” Kuylen and Brazilian Roberto Silva de Lima on the bench. BDF served notice of their return to form for the Closing Season, with second half goals from Shane “Chucky” Flores (67’) and Trimayne Harris (81’ PK), to secure a 2-2 draw. The draw regained some respect for BDF, but was a satisfactory outcome for the Verdes management, who were quite satisfied with the 9-3 aggregate, and no major injuries or expulsions affecting their line-up going into this weekend’s Final game 1. There will be no big blow-out in the finals; that is almost a guarantee with the two teams being featured. In their regular season Week 5 meeting on September 9 at the Isidoro Beaton Stadium, home standing Bandits were 1-0 winners over Verdes; and their Week 12 clash on October 29 at the Norman Broaster Stadium ended in a 1-1 stalemate. In their 14 regular season games, both teams conceded less than 1 goal per game, the Bandits allowing 12 goals only, while Verdes gave up 11. In the offensive department, the Bandits have the edge, with a total of 38 goals to Verdes’ 26. The Bandits’ Honduran striker Georgie Welcome leads all scorers with 14 regular season goals; while Verdes’ Brazilian striker, Alcides “Paco” Thomas was next in the goal scoring column with 10 (along with Police United’s Danny Jimenez and Wagiya’s Krisean Lopez). Elroy Smith of Bandits and Jarret Davis of Verdes have 5 goals each in regular season. 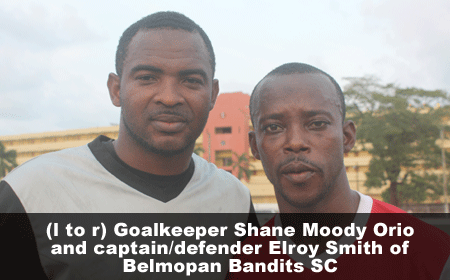 The defending champions, Belmopan Bandits SC will feature both the top goal scorer, Georgie Welcome, and the top goalkeeper, Shane Orio, when they take the field against challengers, Verdes FC, on Sunday afternoon in San Ignacio. Bandits will be missing captain/defender Elroy Smith and midfielder Khalil Velasquez, out with red cards; and will be leaning a lot on the multi-skilled veteran Jerome “Jarro” James on both attack and defense, while looking to Honduran midfielders Darwin Bermudez and Kervin Johnson to help create opportunities for lead striker, Georgie Welcome. With key starters, Smith and Velasquez unavailable on Sunday, besides being “on the road,” we suspect the Bandits will be cautious on attack, to avoid being too vulnerable to the Verdes “contra golpe.” Veteran Dalton Eiley will be very busy manning the Bandits’ sweeper position on Sunday. Verdes will be depending on their team’s stern defensive philosophy, anchored by sweeper Victor Cruz Mejia and stopper San Mendez, along with flank Everal Trapp to keep the Bandits attack at bay; while they will seek to manufacture the winning goal through a talented midfield trio, including Brazilian Rodolfo Silva de Lima and former Bandits, Denmark Casey and Elroy “Bibbs” Kuylen, creating spaces to facilitate the penetrating wizardry of rising star, Gilroy “Bredda” Thurton and efficient finisher, Brazilian Alcides “Paco” Thomas. This will certainly be a low scoring, but very interesting and intense match-up; what a championship final game 1 should be. You don’t want to miss this one. 4:00 p.m. – Verdes FC vs Belmopan Bandits SC – Norman Broaster Stadium. Game 2 is next Saturday, December 9, in Belmopan.